It’s been a very long time since I have posted and I apologize. Life has gotten away from me a little with time and I promise to be back at my blog much more often!! These baked asparagus fries are delicious and super easy to make. You can season the panko bread crumbs any way you like or even make your own bread crumbs to use. Place on a wire rack on a foil lined cookie sheet or you can lay them directly on the foil lined sheet but should turn them once half way when cooking. Bake at 375 degrees for approximately 12-14 minutes. The crumbs should be browned and the asparagus softened. Serve right away. I served ours with our oven roasted potatoes (recipe here: Oven Roasted Potatoes ) with a bit of sour cream and a ham steak that was warmed in a frying pan in a little pineapple juice. 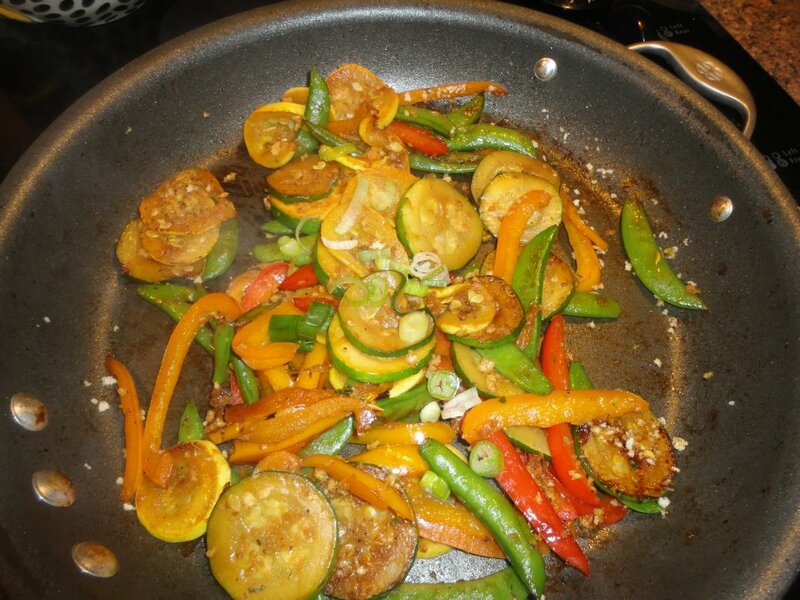 Baked Zucchini and Summer Squash on the menu tonight. 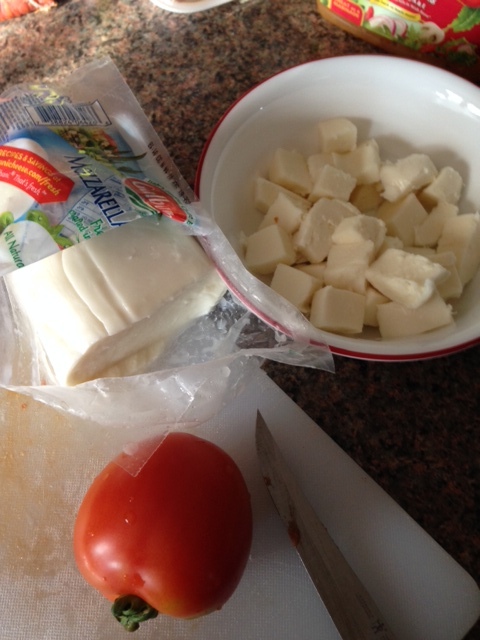 Slice and layer squashes, cover in sauce, top with grated mozzarella. We like onions on ours too but you can use anything you like (mushrooms, peppers, ground beef, shredded chicken and so on). Comfort food minus the carbs!! Bake at 425 until squash has softened, cheese has melted and onions have browned. I follow the blog of a talented woman and wonderful writer. Cynthia Reyes was one of the first blogs I found when I looked into the “blogging” world. I was immediately drawn in by her stunning photography and the way in which she “uses” words to explain her posts. 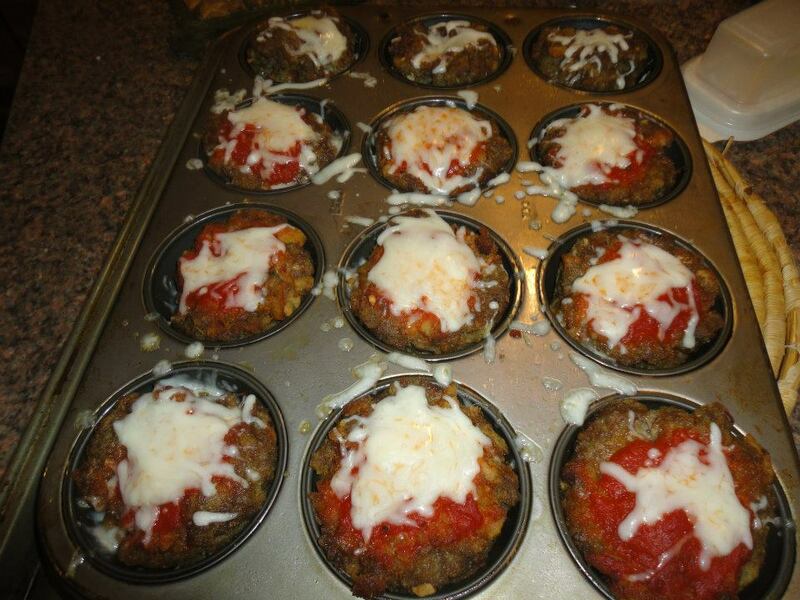 Her recent post Idiot-Proof Comfort Food had me laughing as usual when she shared she made a 2 ingredient recipe and forgot one of the ingredients! Her book, which is available on her website, is as entertaining and fun to read as her blog. On vacation last summer, I could barely put it down reading into the wee hours of the morning! I decided to try this recipe yesterday and while it takes time, it was worth every minute! The nice part was I was able to do chores around the house while it cooked. 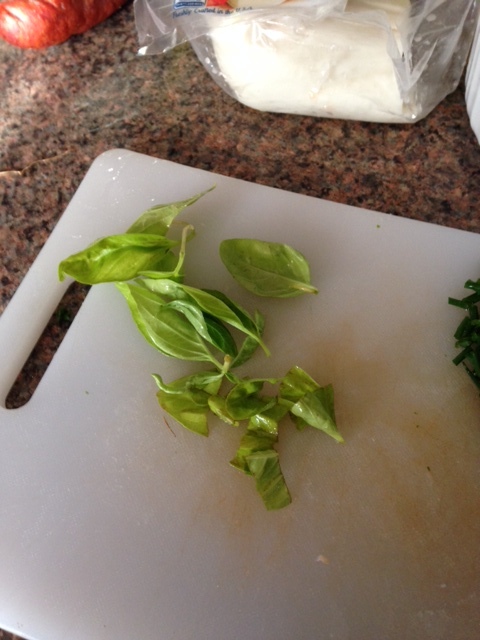 Here are some pictures of how I made the recipe she shared! This is the finished dish and let me tell you, for someone trying to watch their diet, this fills just about every food desire you have. It’s sweet, savory, filling and delicious! I followed the directions using setting 1 on our electric stove. 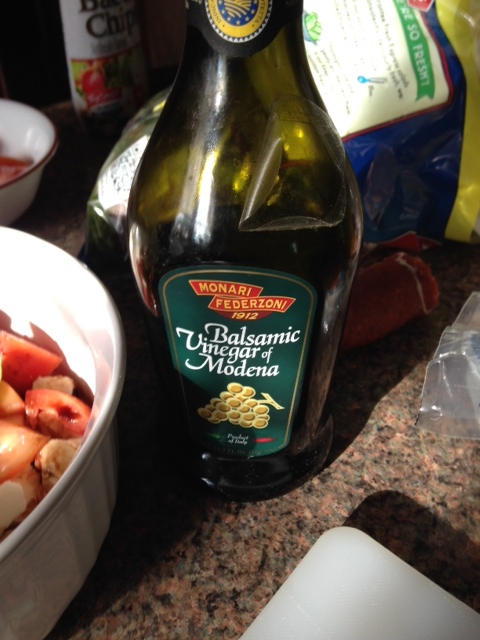 I also used about 1 TBSP of butter and 1 TBSP of olive oil when I started the onions. I covered it as well. The potatoes do get a bit mushy if you stir it when it’s done but I like it that way. I portioned mine out into small containers and will use it as my “fill in” snack in between meals this week. It may not last a week as my mother has already dug in to get herself a bowl!! Do take the time to visit Cynthia’s blog. I am sure you will enjoy it as much as I do! 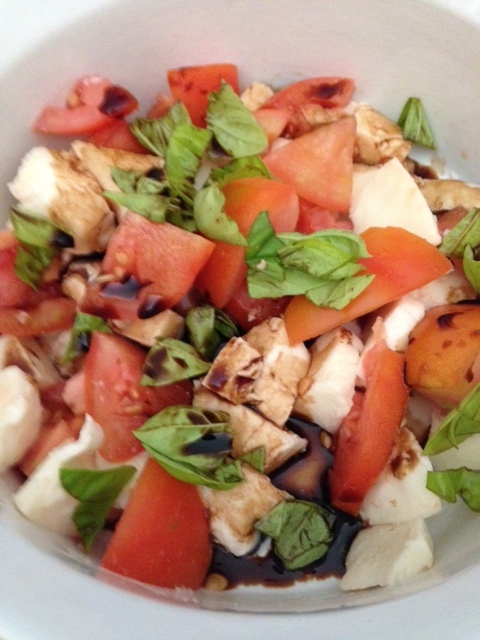 A nice light salad is perfect for lunch or dinner on warm days. 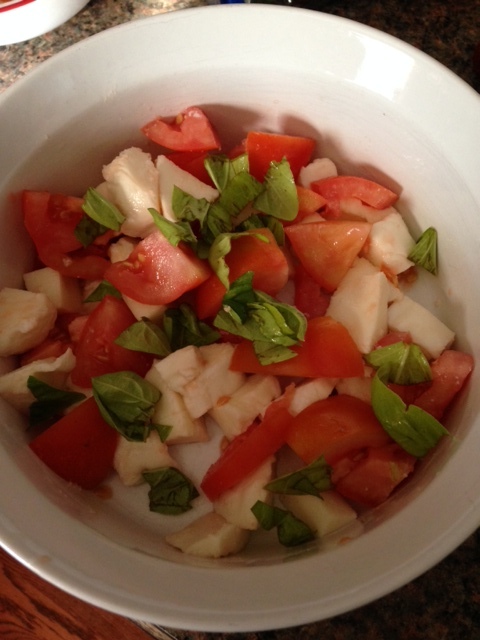 Tonight I decided to make a caprese salad. Most places leave the tomatoes whole, but I like to chop it all into nice size chunks and drizzle with balsamic vinegar. This was a great side to serve with our leftover Pork Roast (recipe here). I hit up a local farmers market today on my lunch break and they had a perfect selection of beans and small (perfect pickle size) cucumbers on sale. I am still waiting to harvest ours so I bought some. 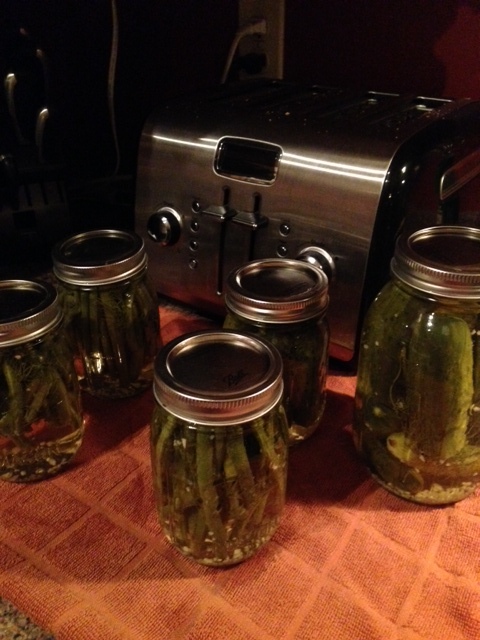 I spent less than $5.00 and made 5 pint and 1 quart size jar of dill beans and dill pickles. I canned them and they will sit now for about 2 months before we will open them as the longer they sit the stronger they!! Dilly Beans are a fabulous treat. 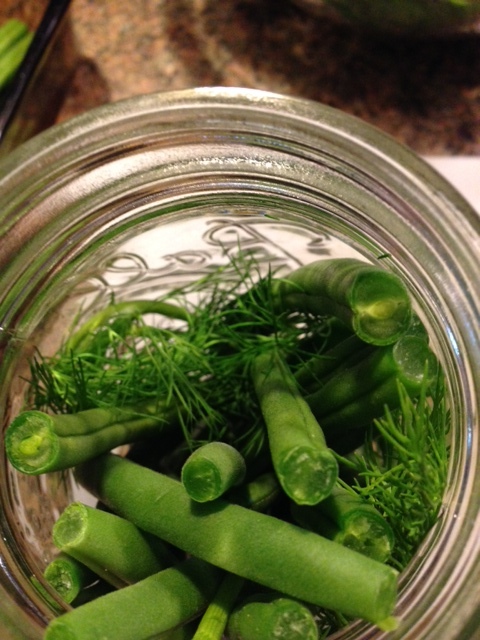 The bean flavor combined with the dill and garlic makes for a wonderful eating sensation. My kids will eat at least one jar a month sometimes more if I let them. I also can some for them to sell in their stand they set up in our yard. 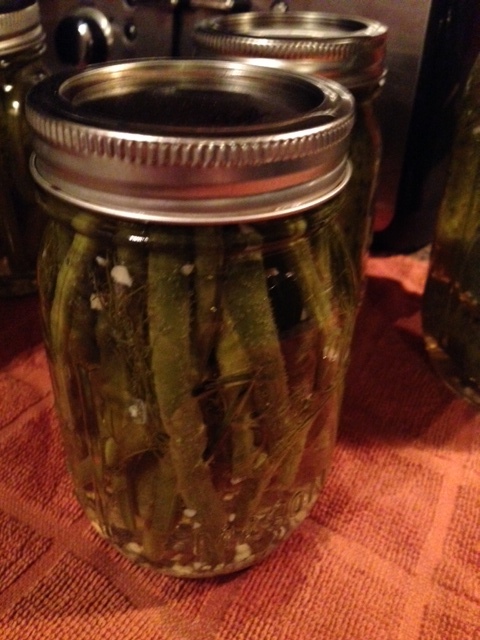 We sell pint jars for $5 and people buy them right up!! That covers the cost of the ingredients and the jars with a little left to add to the “kids” fund. put all in a pot and bring to a boil. 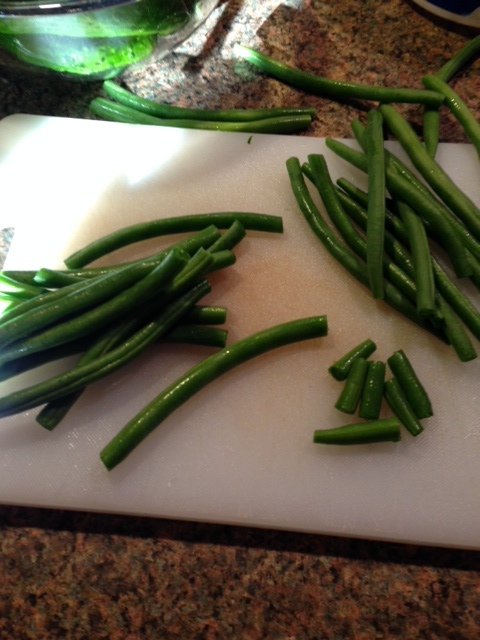 Wash and cut the ends off the beans. Discard the ends. 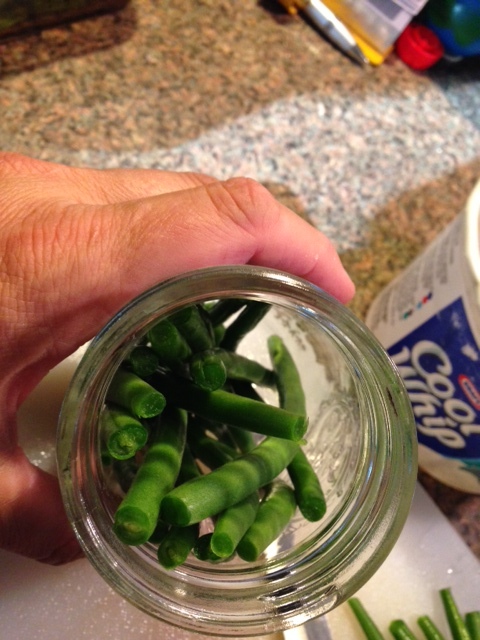 Then trim the beans to fit into your jars (I have used all sized jars it doesn’t matter if you want them long or to fit into a 6 oz jar). DO NOT THROW OUT YOUR TRIMMINGS!! 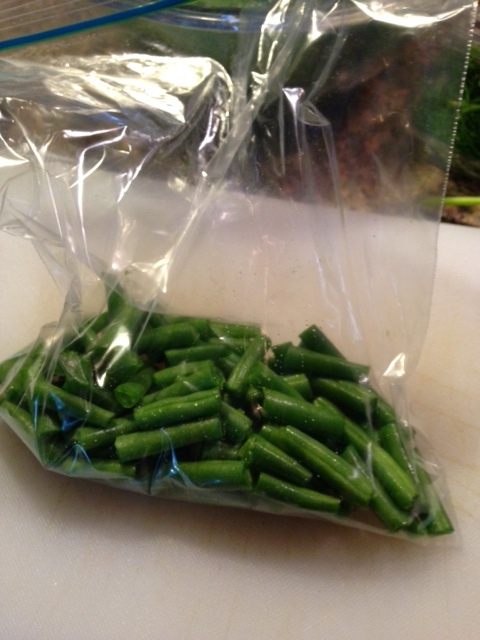 You can put them in a freezer bag for soups or you can steam them for a dinner!!! 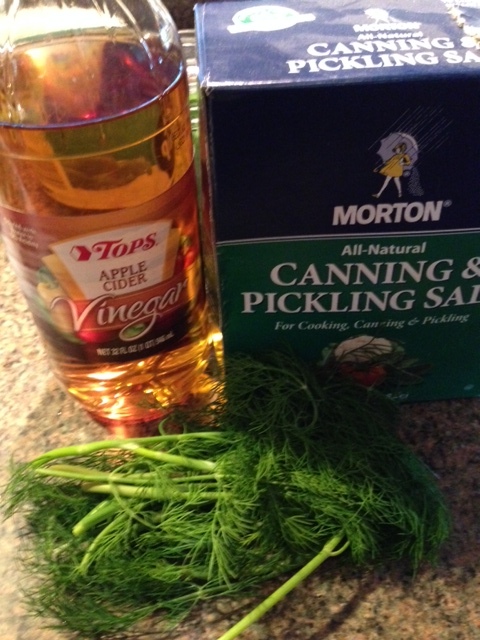 (you have to follow canning methods same as any other item you can) If you don’t know how to can, please google it. It’s so easy!! Using the hot jars, stuff them with the beans/cucumbers making sure to rotate the jar so they are standing upright and not shoved in. 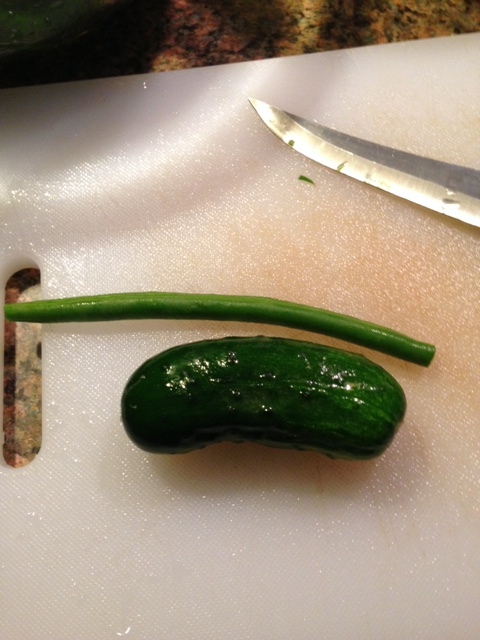 Stuff in 3 nice size sprigs of dill in between the beans/cucumber. Using the funnel, ladle the hot brine in to cover the beans/cucumbers completely leaving 1/2 inch headspace at the top of the jar. Wipe the jar and place the hot lid on. Place the ring around and tighten until just tight. 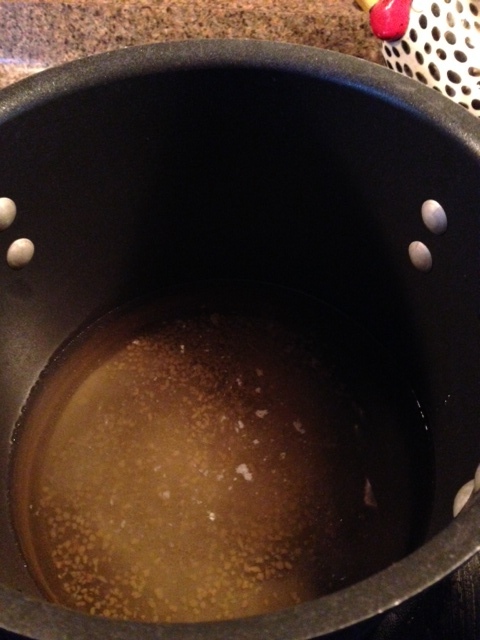 Process in a hot water bath (canning method) for 10 minutes. 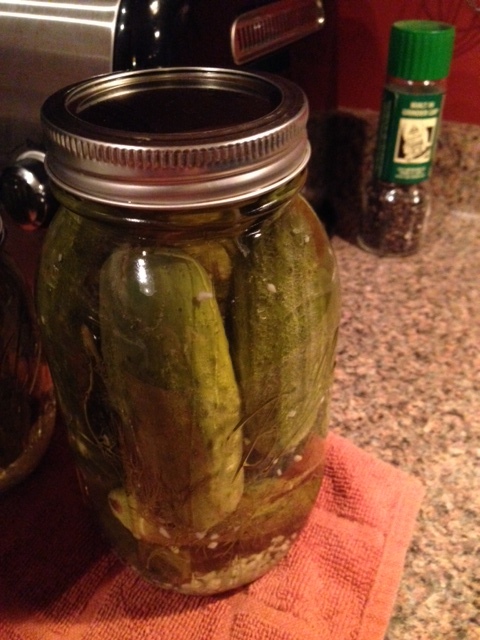 The brine makes enough for about 5 pint size jars. If you are worried about running out, make a double batch. Whatever you don’t use, let it cool and store in a sealed container in the fridge until you are ready to can more. You can reheat it or add it to the new batch you make. 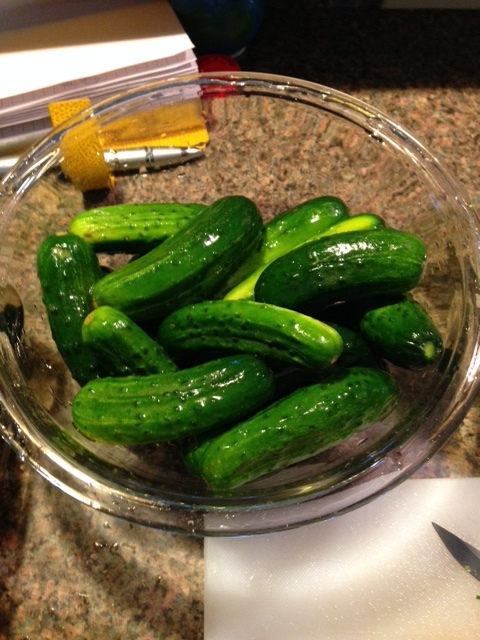 I made a double batch as I will make another 5 jars of dilly beans when our beans are ready and I will make at least 8 more jars of pickles (sliced larger cucumber style) again when our cucumbers are ready. It’s stored in the fridge and I will add it to the next batch of brine I make when the time comes. This is a wonderful homemade meal on the fly. 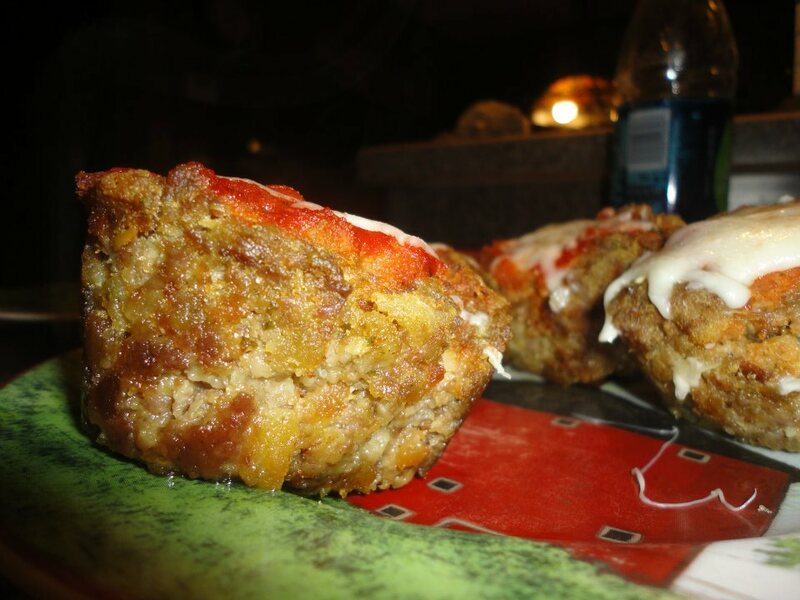 The meatloaf is fun for the kids to help make and it’s super tasty. I do not make a starch with it because there is stuffing right in the meat so you just need a side veggie and dinner is on the table!! 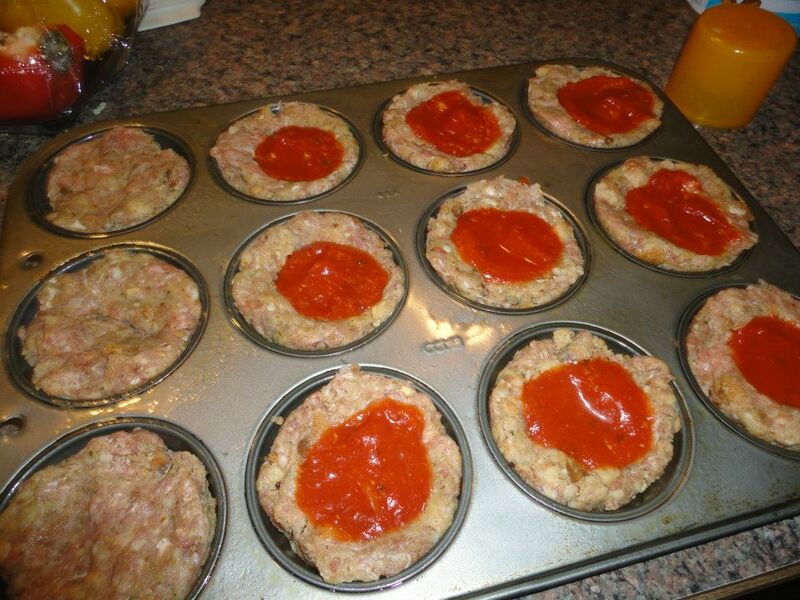 little tasty cups of meatloaf!! 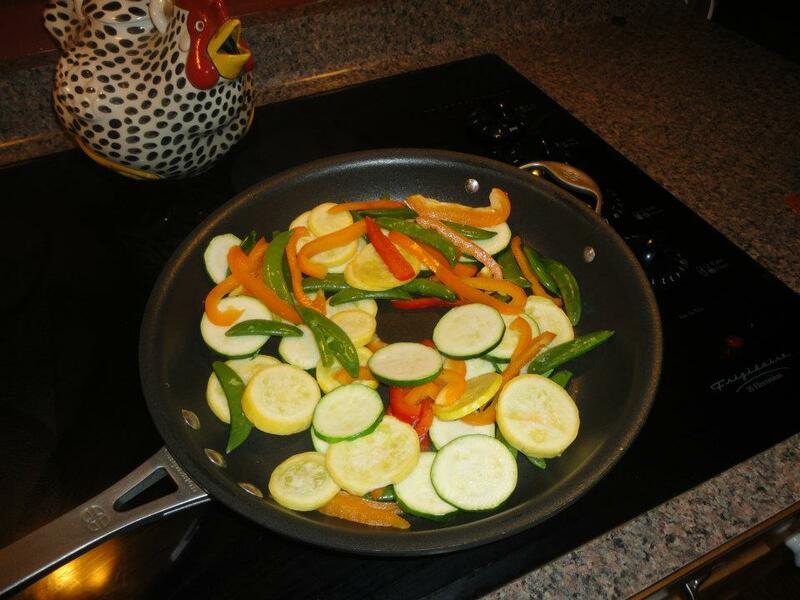 My kids call this veggie side “rainbow in a pan”. Super easy and pretty too!! 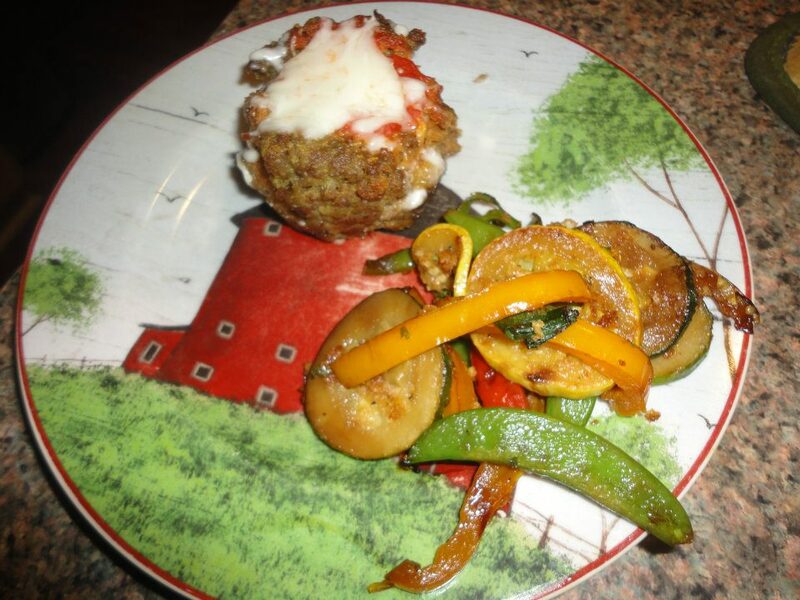 Mini Meatloaf recipe (this is adapted from the Kraft website) HEAT oven to 375°F. Mix all together in a bowl. 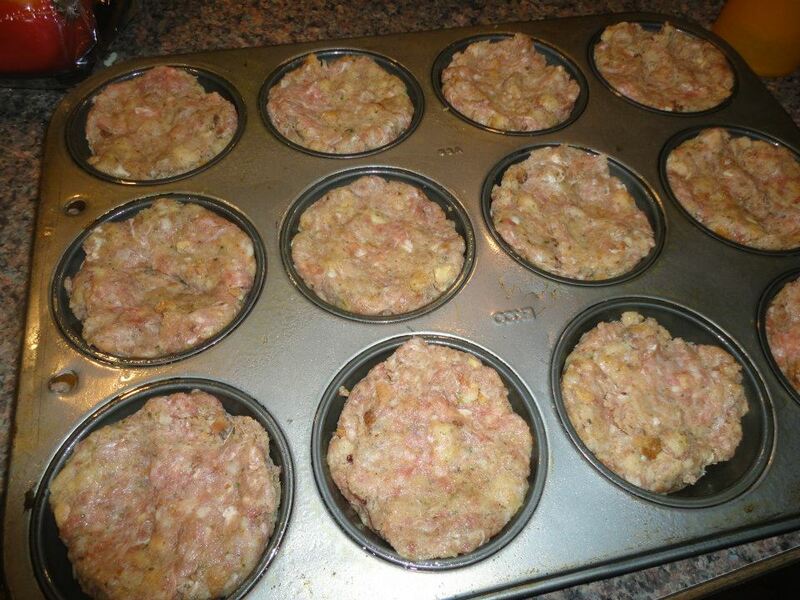 Press into 12 muffin cups sprayed with cooking spray. Makeindentation in center of each with back of spoon; fill with spaghetti sauce (or you can use Ketchup or alfredo or even BBQ sauce). BAKE 30 min. or until meatloaves are done (160°F). Sprinkle on cheese and bake 5 min. or until melted. Let stand 5 minutes before serving.